It took 25 years of research and clinical investigations for Curaderm BEC5 to be proven to be the natural treatment of choice for skin cancers. While Curaderm treats precancerous and cancerous lesions of the skin, the makers of Curaderm wanted to develop a sunscreen that would specifically help to prevent the formation of these lesions before they occurred. In addition, they were concerned about the "questionable safety" of some potential cancer inducing sunscreen agents ( found in virtually all sunscreens ) that have been referred to in a number of clinical trials. As a result of these concerns, they have developed a unique multi-functional sunscreen that covers all these issues and they have named it Curasol. 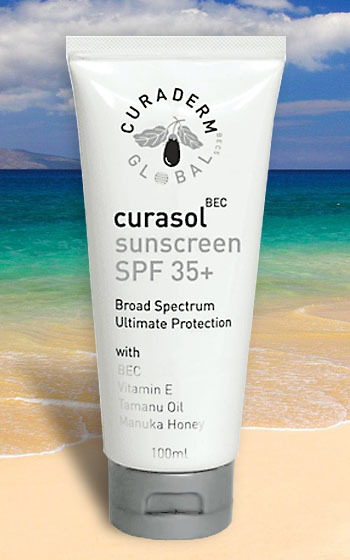 Curasol BEC Sunscreen 35+ SPF provides a broad spectrum of protection from the damaging effects of UVA and UVB radiation. Curasol contains not only the BEC glycoalkaloids that have been shown to attack the non-melanoma skin cancer cells, but also tamanu oil, Vitamin E and manuka honey to help prevent skin cancers, the effects of aging, as well as promoting healthy skin. Exposure to ultraviolet light (UVA and UVB) accounts for the vast majority of the symptoms of premature skin aging such as wrinkles and skin cancers. UVB radiation causes burning of the skin and increases cancer risk. UVA radiation causes skin to lose elasticity and promotes wrinkling, also interferes with immune system. Perhaps then the most important skincare product available to prevent wrinkles and skin cancer is an effective, well researched sunscreen. The active sun screen compounds are divided into two groups: organic chemical compounds and inorganic chemical compounds. The organic compounds (such as oxybenzone) protect skin by absorbing UV radiation. The inorganic compounds are opaque materials (such as titanium dioxide or zinc oxide) which scatter UV radiation. While these sun screen compounds help to prevent damage from UV radiation, there are disadvantages. The inorganic compounds are opaque and thus can leave a visible white color on the skin. To combat this effect, manufacturers have been able to reduce the size of the particles to "nanoparticle" size (less than one millionth of a millimeter). These nanoparticle formulations can't be seen on the skin, but retain their sun screening properties. There have been studies that have raised concern over the use of organic and inorganic nanoparticle formulations and whether these particles can be activated by UV light, thus inducing free radicals that may damage cells and lead to skin cancer. However, these studies have been limited and they are inconclusive. Worldwide health agencies have concluded that the benefits of sunscreens outweigh any risks. In order to overcome the potential effects of the organic and inorganic active ingredients in sunscreens, the makers of Curasol have added vitamin E to scavenge free radicals and the BEC glycoalkaloids to destroy any damaged cells that could potentially lead to skin cancer. The amount of BEC glycoalkaloid is NOT of a concentration that can effectively reverse an existing basal cell or squamous cell carcinoma. If you have a pre-existing non-melanoma skin cancer lesion and you are interested in using the BEC glycoalkaloids, you should obtain the higher concentration BEC found in Curaderm BEC5. In addition to the BEC glycoalkaloids and vitamin E, Curasol BEC Sunscreen SPF35+ also contains tamanu oil and manuka honey. Tamanu oil possesses potent antibacterial, antiviral and antifungal properties. It also has potent anti-inflammatory properties and is highly recommended for treating scars. Manuka honey is a rich, amber colored honey with a strong aromatic flavor. Manuka honey also has strong antimicrobial properties and is often referred to as the "healing honey of the tea tree." Curasol's unique ingredients combine to create a formula that acts to inhibit keratosis formation, has anti-cancer, antimicrobial, antiviral and antifungal properties, as well as skin soothing and moisturizing properties. Apply Curasol BEC Sunscreen SPF 35+ to dry skin approximately 30 minutes prior to exposure to the sun. While this sunscreen is water resistant, it is advisable to reapply to dry skin after swimming and/or exercise.